Popular Science magazine has named Liangfang Zhang, a nanoengineering professor at the University of California San Diego, in its 15th annual “Brilliant 10” list, a lineup of “the 10 most innovative young minds in science and engineering.” Zhang was recognized for his revolutionary work in the field of nanomedicine, which focuses on nanomaterials for medical applications. Zhang invented a way to make nanoparticles perform therapeutic tasks in the body, like treat injuries and deliver drugs to specific sites, without being rejected by the immune system. By coating nanoparticles with natural cell membranes from the body, like red blood cell membranes and platelet cell membranes, researchers can disguise nanoparticles as the body’s own cells. “We’re essentially camouflaging nanoparticles to look and act like they belong in the body. We want to mimic the natural interaction of the body’s cells with the immune system in order to make new biomimetic nanoparticles that can safely function and survive in the body for long periods of time,” Zhang said. Zhang’s cell membrane coating technology made its debut in a 2011 study, in which his team showed a new way to disguise nanoparticles as red blood cells. The method involved collecting the membranes from red blood cells and wrapping them around polymeric nanoparticles. This work was an important first step toward a nanodevice—for applications like drug delivery—that could circulate in the body for extended periods without being attacked by the immune system. Since red blood cells live in the body for up to 120 days, Zhang figured they would be good models and resources for making long-circulation drug delivery nanodevices. In the 2011 study, Zhang’s team showed that nanoparticles coated with red blood cell membranes circulated in the bodies of mice for up to two days. This was an improvement over other nanoparticle systems developed for drug delivery—these are coated with a synthetic material made to temporarily suppress immune recognition and circulate in the body for just a few hours. Zhang explained that a major concern of the synthetic coating is that, after repeated use, it will eventually trigger an immune response and in the long run, these types of drug delivery systems could be drastically less effective. Using the body’s own red blood cells marked a major breakthrough in the field of drug delivery research. Trying to mimic the most important properties of a red blood cell in a synthetic coating requires an in-depth biological understanding of how all the proteins and lipids function on the surface of a cell. It also poses what many researchers consider an insurmountable technical challenge—recreating that same cell surface precisely in the lab. But Zhang’s approach was to just take the whole surface membrane from an actual red blood cell. And this red blood cell disguise offers more than just extended circulation time in the body. Because red blood cells are one of the primary targets of pore-forming toxins, such as those produced by MRSA (methicillin-resistant Staphylococcus aureus), Zhang reasoned that his faux red blood cells could also serve as decoys to lure these toxins away. Indeed, his team showed that nanoparticles coated with red blood cell membranes were capable of removing MRSA toxins from the bloodstream and as a result, also helped clear up infections caused by MRSA bacteria. This is essentially a new way to combat hard to treat bacterial infections—without the use of antibiotics, Zhang said. Zhang describes himself as a chemical engineer with biomedical interests. 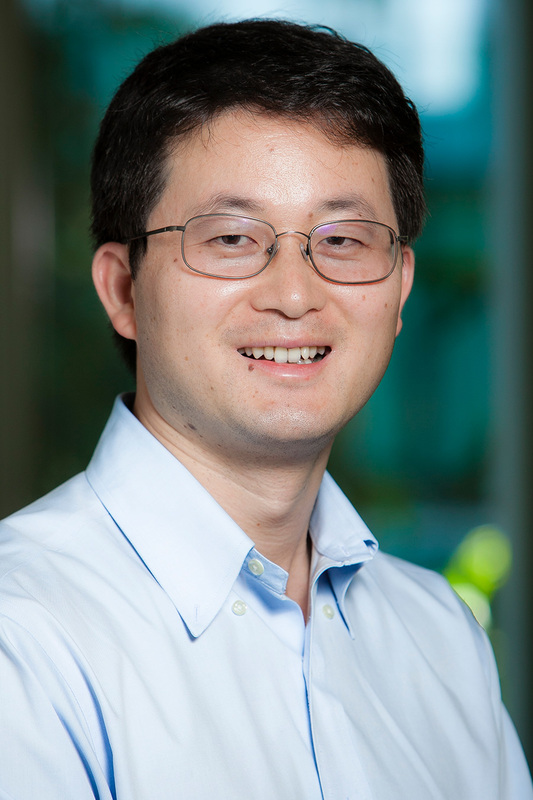 He earned his bachelor’s and master’s degrees in chemical engineering at Tsinghua University in China, then earned his PhD in chemical and biomolecular engineering at the University of Illinois at Urbana Champaign, where his research focused on the fundamental science of cell membrane proteins and lipids. Afterwards, he pursued his postdoc at MIT, where his research on lipid-polymer nanoparticles for drug delivery was more applications focused. In 2008, Zhang became an assistant professor at UC San Diego. He was one of the first faculty recruited for the university’s newly formed Department of NanoEngineering. Shortly after, his idea to combine natural cell membranes with synthetic nanoparticles for drug delivery and other biomedical applications was born. Over the past five years, Zhang and his lab have taken their cell membrane coating technology to new heights. They’ve disguised nanoparticles as human platelets, which have a natural affinity for binding to damaged blood vessels and certain pathogens in the body, like MRSA bacteria. Because of this affinity, platelet-mimicking nanoparticles could be used for targeted drug delivery. Zhang’s team conducted several experiments. In one, they packed platelet membrane coated nanoparticles with a drug used to heal damaged arteries and administered them to wounded rats; in another experiment, they packed the nanoparticles with antibiotics and administered them to mice infected with MRSA bacteria. In both cases, the drugs were delivered primarily to the affected areas. “That shows the power and the promise of targeted delivery,” Zhang said. Zhang’s team has also made disguises out of the membranes of beta cells, which are insulin-producing cells in the pancreas. They coated a nanofiber with beta cell membranes to create a pancreas-like microenvironment that encouraged beta cells to congregate, grow and produce more insulin. This work could lead to new treatments for patients with diabetes. “This is another example of mimicking natural interactions in the body to create more effective therapies,” Zhang said. But researchers are not stopping there. Next on their list is using cell membrane coating technology to develop new systems for combating cancer tumors. Zhang is also working with several biopharmaceutical companies in San Diego to manufacture the red blood cell coated nanoparticles at large scales and get them into clinical trials. Zhang and the rest of the “Brilliant 10” are featured in the September/October issues of Popular Science magazine and online at http://www.popsci.com/brilliant-10-2016.